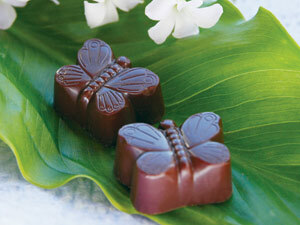 Lillie Belle Farms Chocolates began 10 years ago on a whim. I asked my daughter, Lillie and my wife, Belle if I could start selling truffles at the local farmer's markets and name them after them. They reluctantly agreed thinking that it was nothing more than a weird culinary phase. In the beginning it was all trial and error, but people kept coming back and demanding more. Without looking back, I dove head-first into the world of gourmet chocolates made in the grand traditions. Using the finest ingredients I could get my hands on, many of which I grew on my own organic farm, I set out to create a chocolate experience that rivaled the best in the world. These days it kind of hard to believe how far we have come in just that simple decade. The reception has been grand and we are proud to sell to retailers and customers worldwide. Growing into a present day staff of 10, and moving some 20,000lbs of finished product a year, the magic is still happening and the fun never stops. "And that's when I get it. Not the chocolate—which he’s right about—but rather Jeff. I get Jeff. The way he stares at me, asking pushy questions, passionately demanding that I tell him about his chocolate—he’s not seeking my approval as I first thought. No, he could care less if I thought his chocolate was good. What he’s searching for is the connection with me. He wants to see if I feel what he feels when he eats the Raspberry or Marzipan Fig chocolate. In this regard, he’s no different than a jazz musician, theater actor, photographer or painter. Artists don’t really care if you think they're good (although I’m sure compliments don’t hurt). I think what artists—especially fiercely individualistic artisans like Jeff who create truly original work—are really searching for is a connection, a shared experience, with their audience." That guy totally got it. He understood that our chocolates are to be experienced.